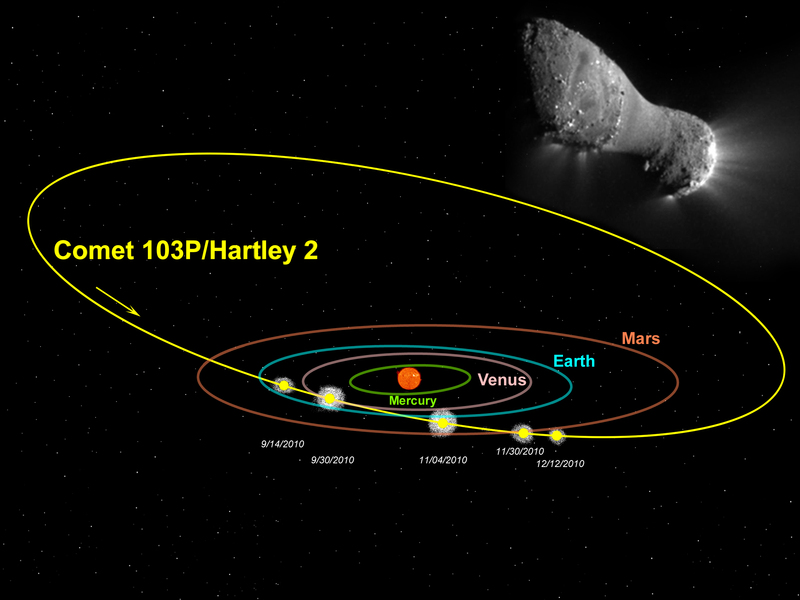 Young Scientist, July 29, 2011: On Nov. 4, 2010, NASA’s EPOXI spacecraft came within 450 miles of Comet Hartley 2, a small comet not even a mile in diameter, which takes about six and a half years to orbit the sun. Designated officially as 103P/Hartley 2, the comet thus became the fifth for which scientists have collected close-up images. Understanding the composition and behavior of comets intrigues scientists because they are some of the first objects that formed around our sun some 4.5 billion years ago and they’ve evolved little since. These chunks of ice, rock, and frozen gas hold clues to what existed in those early days of the solar system’s formation, says Combi. So he uses an instrument onboard SOHO called SWAN – for Solar Wind ANistropy – to observe how water streams off of comets. SWAN’s main job is to map the distribution of hydrogen atoms across the entire sky. This helps those who study the sun’s magnetic environment by tracking how the interstellar wind of particles moves through our area of space. But the instrument also can help track comets, which are generally surrounded by an extremely thin atmosphere of water vapor. Under ultraviolet light from the sun, the hydrogen atoms fly off the water molecules at great speed and produce a huge cloud or “coma” of hydrogen. The coma absorbs sunlight and then re-emits it, making it detectable in SWAN images. Observing the clouds can then help determine how much water is being vaporized from the comet over time. SWAN has collected data on nearly one hundred comets, so when Combi and his colleagues at Michigan learned EPOXI was destined to get a closer view of Hartley 2, they pored over old data from that comet’s most recent approaches in 1997 and 2004. Unfortunately, the sun obscured SOHO’s view of Hartley in 2004, but the 1997 data was accessible. They compared this to SWAN’s 2010 observations from Sept. 14 to Dec. 15. Standard models of how comets behave helped Combi’s team correlate the hydrogen signature to just how much of the comet’s surface should be giving off water, a process known as “sublimating,” because the water turns directly from ice to a vapor without passing through a liquid phase. The amount of surface area predicted didn’t jibe with what EPOXI itself saw – a comet that only gave off water from one half of its shape. But EPOXI also captured images of an extended halo of icy fragments that burst off the comet, most likely flung into space by carbon dioxide emissions on the comet’s surface. These ice chunks probably added sublimated water to the hydrogen cloud. Comparing EPOXI observations to SWAN’s did not, however, always jibe with current understandings of comets. EPOXI measured cyanide output – an element that tends to be fairly minimal within comets but is so bright that it is easy to measure and indeed was one of the first elements identified in comets in the 1880s. Cyanide output typically correlates to water output, but in this case EPOXI saw a burst of cyanide – it increased seven times on Sept. 17 — at a time when water production was only gently increasing. With only five comets privy to a near spacecraft fly-by, new data points like this can help refine our understanding of comet composition. It remains an interesting scientific debate whether anomalous comets like Hartley 2 behave differently because they formed of different materials originally or because they’ve experienced different environments over time. As more analysis of the EPOXI and SWAN data come, the next few years should provide additional insight into these remnants from the very dawn of the solar system.